Triang No. 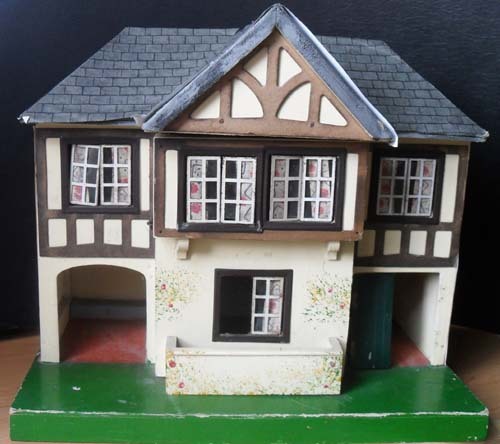 61 [with window box] – Here we go again, a new dolls house to add to my collection. It needs slight renovation but all together in not too bad condition. I bought this at an auction, the first one I have ever been to, so I was glad I had the highest bid. I don’t really have room for another house but it looked so lonely I just had to have it, I will make room somehow, with a little rearranging. 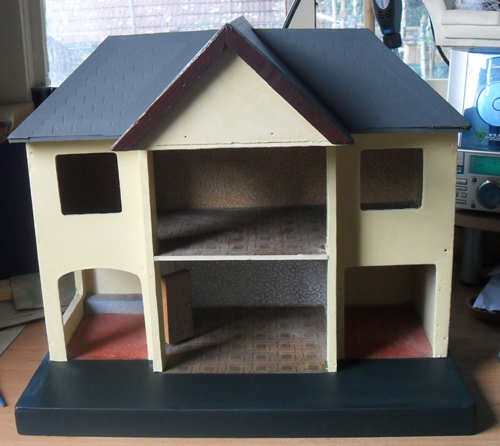 The roof has been papered, so this will have to be stripped off, but the roof looks in quite good condition underneath. The window frames need attention as they are a bit rusty, there are curtains at the windows, which I am very pleased about, as the other houses I have do not have any. I can carefully remove them to tidy up the window frames. 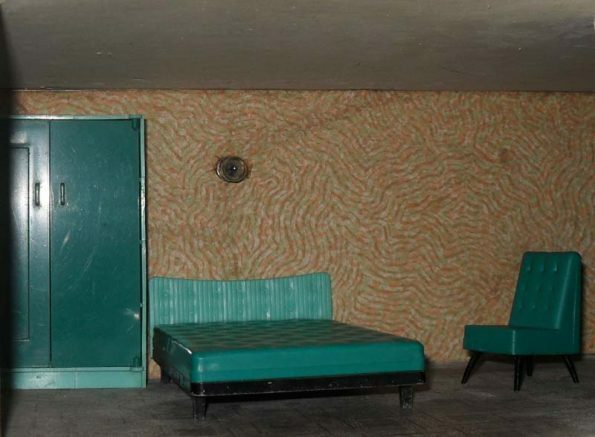 I am not going to do anything to the inside of the house as it looks as if the wall and floor paper is original. 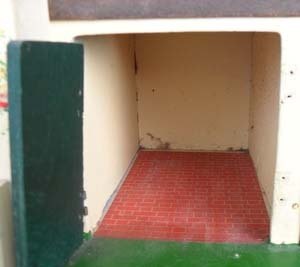 ~ Remove the windows from the dolls house, by gently lifting the tabs on the edge of the frame. ~ Remove the window inserts from the frame, by carefully bending up the little tab on the insert which fits it to the frame, using a pair of pliers. Do this just enough to all the little tab on the window frame to be released. Only one tab on each insert needs to be bent. ~ If you window inserts have curtains, gently remove them, I use an old kitchen knife with a broken end to ease up the lip of the insert. Take care not to damage the material. I have found the best way to do this is by removing the plastic first, giving more room for the curtains to slip out without too much force. They are not glued in, just held in place with the lip on the insert. ~ Next ease up the lip so that there is room to get into to remove any rust or dirt. ~ On the inside of the window insert, using a dremel drill with a small rough grinding bit on it start to clean up the insert, removing any old paint, dirt and rust. ~ Turn the window insert over, using a cotton wool bud dip into paint stripper and remove the paint, wipe off using kitchen roll. Remove and rust or dirt as described above. ~ Cut a piece of clear plastic to fit the window. ~ Fit the clear plastic into the groves around the edge of the window. ~ Place the piece of curtain wrong side up, against the opening edge of the grove on the window, carefully ease it into the grove. Take care not to damage the curtain. ~ [not shown] Using a hammer and a piece of wood gently tap the grove closed, use the piece of wood to protect the metal and give it a more even finish. 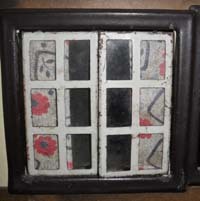 ~ Gently bend the little tabs on the window up a little so they can be fitted onto the tabs on the brown window frame. ~ When in place bend tabs back over the pins so they are at right angles to the frame, again be very gently and take your time. ~Repeat the instructions for the other half of the window. When removing the beams you must take care, as they are made of card and tend to become very flimsy with age. They are held in place with nails so once these are removed they just lift off, unless the nails have rusted which tend to make bigger holes in the card. One of my beams split whilst removing the nail from one of the corners. I repaired this with paper parcel tape on both sides of each of the corners to give it extra strength. Also filling the nail holes with PVA glue. remove any loose paint, from previous over painting. ~ I use paper gummed parcel tape, it gives a good finish and sticks well. ~ Once the parcel tape was dry, I painted the roof grey, it is now all neat and tidy. ~ I use an emulsion paint and then seal with a matt clear varnish. 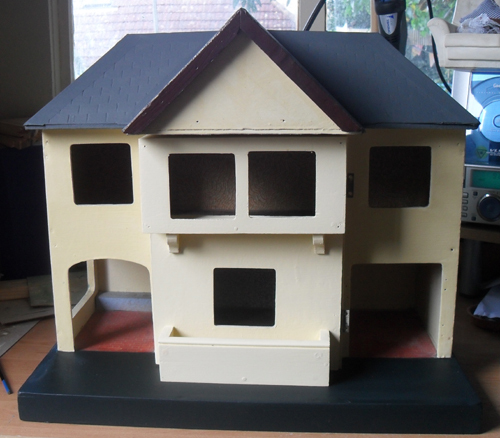 The House has now been painted on the outside, the roof and the green base. 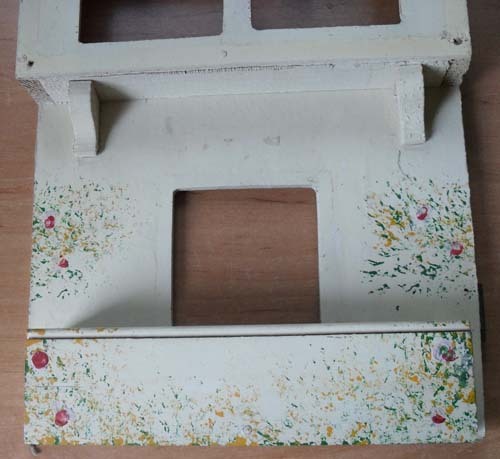 This is a closeup picture showing the flowers painted on the hinged front panel. The house is now finished, and the front, the garage doors and the beams have been fitted. I am quite pleased with the result. 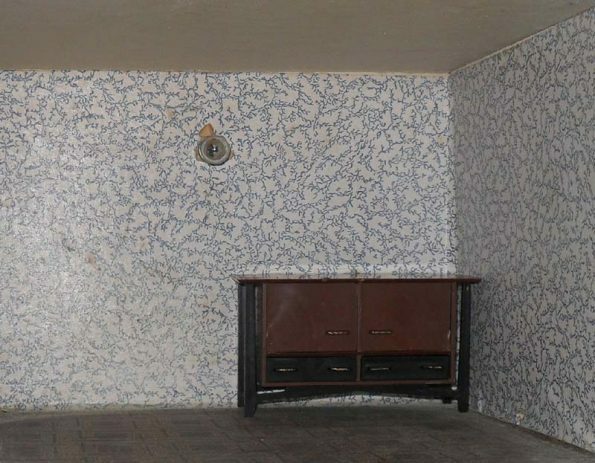 I have not changed the wallpaper on the inside of the house, as it has original paper and the condition is quite good.